Are you planning a Halloween Party For Kids this year? 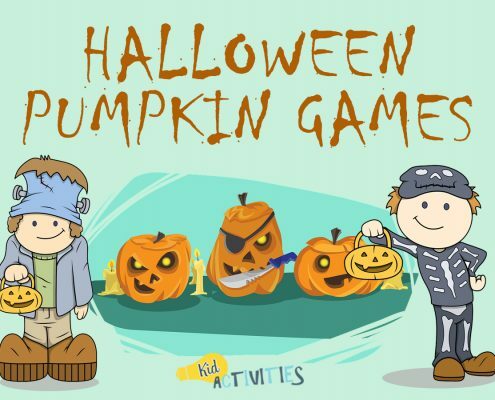 Are you looking for some fun, spooky, and exciting Halloween games for the attendees to play? 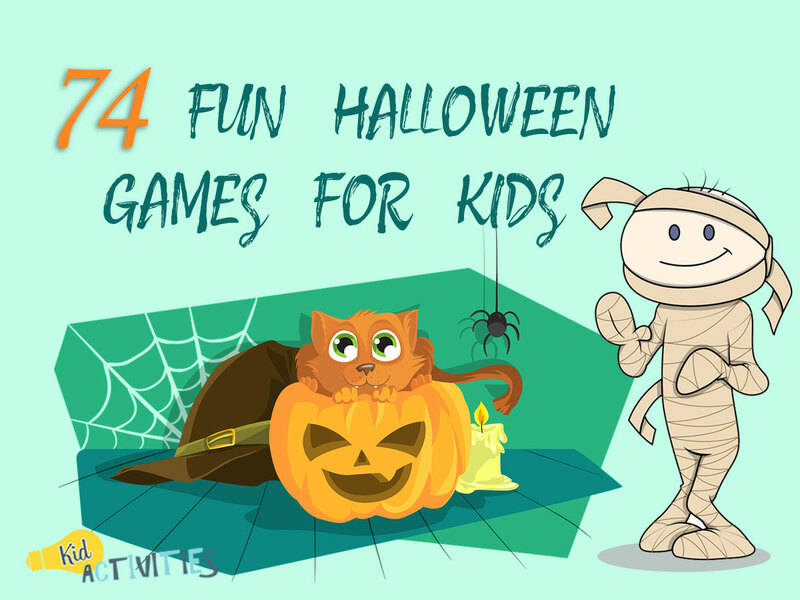 We’ve gathered together 74 Fun Halloween Games For Kids Of All Ages. They range from classic Halloween games like the Circle Ghost Story through to the super gross Halloween Surprise Goop-Scoop. They are hilarious activities that are guaranteed to keep the children entertained. These Halloween party games are ideal for both Halloween classroom parties and kids parties at home and. Let’s check them out! Take a cardboard box and paint 3 pumpkins on it. Here are some tips for making really good looking cardboard pumpkins. Cut out large mouth shapes to throw in the bean bags. Put numbers of 5, 10, 15, above each mouth opening. How long can you keep WHITE SKELETON HEADS (Made from white balloons) in the air? Draw the faces with magic marker -You could also use nets to catch them. Before the event: Write a joke on one card and a punch line on another. Be sure to mix the cards up. The number of different jokes depends on the size of the group. Give each person a card. Explain that they may have a joke or a punch line on the card. On a given signal, they are to walk around the group trying to find the other part of their joke/punchline. When they find their other half, you may ask them to get to know their new partner by asking things like favorite spooky movie, their best ever costume, dream costume, etc. When this is done, everyone can return to a circle and, with their partner, tell their joke. Dived kids into teams of three. Choose one child from each team to be a “mummy”. The other 2 are the mummy wrappers. Have the mummy stand with their hands and at their sides and their feet together. No clothing can show when the wrapping is done. Although the toilet paper will tear from the roll, teams must continue wrapping. Be sure to have a camera ready!!! Before the party cut several strips of paper; about twice as many strips as there are children. On half of the strips write the word ‘treat’. On the other half write ‘trick’ with a trick such as “hop on one foot””, “pat your head and rub your belly”. Place all of the strips in a Halloween bag. Blindfold one child at a time and have them reach in and grab out some messy seeds. Have small paper cups ready with each child’s name on it. Put their ‘goop’ in their cup. After each child takes their turn, have each one count out their seeds. Games like this are fun if they are done behind a screen or door–where children previously don’t see what they will be doing. Fill a large tub-type container with something disgusting such as cooked pasta noodles or jello. It needs to feels gross, slimy or oozy! Bury small plastic prizes in the ‘guts’. Using permanent markers, draw irises, pupils, and bloodshot veins on the 12 ping-pong balls. The object of the game is to race around a specific course with a handful of least six ‘eyeballs’. When the first players reach the end of the course, he/she hands the ‘eye-balls’ to the next player. Dropped balls must be picked-up before the exchange of balls. The first team to complete the course wins. 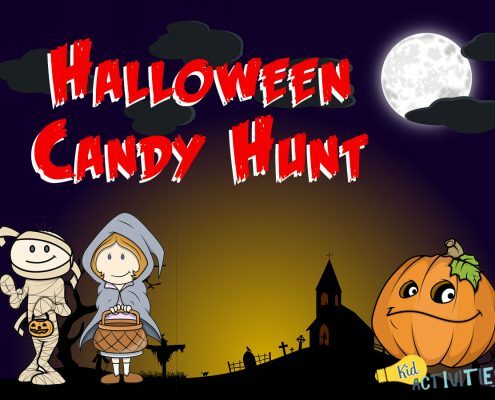 8) HALLOWEEN TRICK OR TREAT GAME – DON’T SAY ‘THAT’ WORD! To help players… post the words prominently on a board where they can be seen often. TO PLAY: Give each player a goodie bag or box with 10 pieces of candy in it. (Have bags labeled with players’ names, so they don’t get mixed up.) Let players know at the start of the game exactly when the game will be ending–this game can be played throughout an entire event.. Sit in a circle and start a scary ghost story. Each player adds on to the story until it reaches a scary ending! It’s best done when each person will say two or three sentences and then stop in the middle of the next sentence-saying…”and then…” The next player then continues. Here are a few scary stories to help you get started. Instead of musical statues do MUSICAL SCARES — where the children get into a frightening pose whenever the music stops! Use Halloween music such as the Monster Bash, Purple People Eater and Halloween Sounds, etc. Draw a large pumpkin face shape for each player. Give each artist/player an orange crayon and a blindfold. Instruct each person to draw a jack-o-lantern face on the pumpkin face. Laugh at the finished creative masterpieces! Purchase plastic skeletons and disassemble them. Hide the bones before the game starts. Have kids search for them and then reassemble the skeleton. For older kids, you can hide the bones and then write out clues for them to follow. You can also get a few skeletons and break the kids into teams. Hide/bury the bones in a sandy play area. Award prizes in method of your choice, however, be sure each player gets a prize for participation. This is a simple race but since pumpkins are not smooth balls and refuse to roll in straight lines, you’ll need plenty of room! You need medium pumpkins and sturdy sticks (or brooms); Use one pumpkin and stick/broom for each team. On the word start, the first person of each team “sweeps” a ball around the obstacles and come back to their team line. One child leaves the room and one child in the room puts a sheet over their head. The child who comes back in the room tries to guess who the ghost is. Place a few themed items such as a candy corn, an apple, mini pumpkin, plastic spider, etc. on a tray. Based on children’s ages-you can do this a few ways. Youth can call out as a group…or individually, in pairs or a teams. If the latter, they can then write down what they remember. 21) HALLOWEEN CANDY BOWL GRABBING GAME! Give each child a container (small bag, bowl, or paper cup). Set a timer for 30 seconds and have kids put as much candy into their containers — without using their hands. When time is up, everyone gets to keep the candy they maneuvered into their containers. If the picture of the witch does not already have a wart on it, draw one. Hang the witch on a wall or a door where there is lots of space around it. When it is a player’s turn, blindfold the child and give her the wart with a piece of tape stuck on it. Spin the player around (not too fast!) and tell her to stick the wart on the witch’s nose. Draw a with on a blackboard, whiteboard or roll paper– and attach it to a wall. Have children take turns throwing a wet sponge at the witch to try to melt her. You can mark certain areas with points and keep score if desired. How to draw a witch. For each team have a box containing a complete costume, each costume should have the same number of pieces (4 or 5 is fun – Shirt pants, shoes, wig or mask, etc.). 1.Cut ten pieces of paper in Halloween related shapes, such as ghosts, bats, pumpkins, or spiders. The shapes need to be about the size of a Ritz-cracker. Place the shapes in a pile beside a small bowl or witch’s cauldron. Have straws available for each player, along with a stopwatch, or a watch with a second hand. Cut out all the pumpkins. Decorate each pumpkin with a funny face. Write the number 1 on the backs of the white pumpkins. Write the number 5 on the backs of the yellow pumpkins. Write the number 10 on the backs of the orange pumpkins. Hide all of the pumpkins. Peel a hard-boiled egg. (this is the eyeball) and then play the game as you would play ‘Hot Potato”. 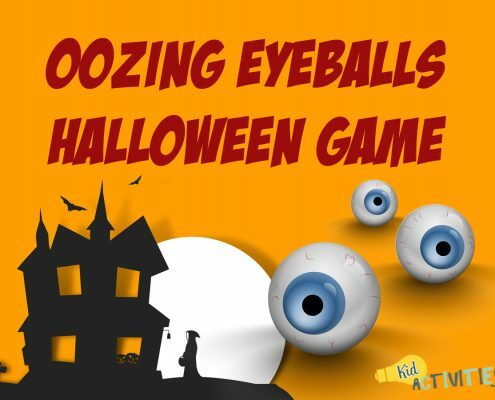 Players sit in a circle and pass the ‘oozing eyeball’ until the Halloween inspired music or sounds stop. The child holding the eyeball when the music stops is out. Keep passing the egg until only one player is left. One person is IT’–the others must sit or lay as motionless and expressionless zombies. The person who is ‘IT’ must do whatever they can to make the zombies smile, giggle, or wiggle in any way without touching them! When ‘IT’ gets a zombie to wiggle, giggle, or smile, that zombie then joins ‘IT’ in trying to get others to smile, giggle, or wiggle. The last zombie wins! Spray paint the soda bottles white and draw eyes and mouths on the bottles once dried. Divide kids into several teams of 3-8 kids each…line up and take turn at bowling over the Ghosts! The small pumpkins are the bowling balls. If it’s for a party- consider prizes. The kids that get a Strike receive another turn to bowl a strike. If they bowl another strike, they receive a prize. hen using prizes BE SURE EVERYONE GETS SOMETHING for playing! Fill a large tub with water and several apples. The players must try to bite” into and “catch” and apple while holding their hands behind their backs. Don’t forget to have some towels handy. Using string, hang mini or regular doughnuts from the ceiling or a tree. The object of the game is to be the first to eat the donut without using your hands! Do not use powdered or cinnamon doughnuts. Plain is the safest–it’s would be unsafe to inhale the sugars. While the kids are out of the room – hide pumpkins around the room. Challenge kids to find them all! When they have found all pumpkins you can serve a special snack or give each child a ‘goodie’. Object of Game: Roll a pumpkin closest to the big pumpkin. You need a large pumpkin. Also purchase several miniature or round sugar pumpkins. To play: Place the big, carved out (Or NOT carved out) pumpkin several feet away. Give each player a small pumpkin. Each player rolls (No tossing or throwing) their pumpkin and tries to be the closest to the big pumpkin. The player closest wins … How to play Bocce Ball. 34) PUMPKIN GAMES — WIN THE PUMPKIN! Start a Halloween themed song and pass a mini pumpkin from one person to another. 36) PUMPKIN GAMES — GUESS THE PUMPKIN’S WEIGHT! Do you have Mr. Potato Head game pieces???! The kids can have some Halloween fun using them with small pumpkins! Have each child take a turn rolling a small, round gourd. Try to find one with lots of bumps for extra craziness! The kid with the longest roll wins. Play on a sloped driveway or a small hill for extra fun. Really fun with young children! Take the children outside to the playground where they toss the seeds onto the ground. Have them make up a few magic words, if they want. The next day, before children go outside–gather the seeds and put small pumpkins in their place. Take the children outside and delight them with the ‘magical’ pumpkins that have grown. If you have enough pumpkins, the children can take the pumpkins home and/or first decorate and paint them to add theme of your space. Take a Halloween-theme container and fill it up with specified number of candy corn pieces. Let the children guess how many pieces are in the container. The closest to the right number wins the container and treats. (or shares with the group) A perfect way to end a successful Halloween party! Stock up on oversized plaid shirts, goofy pants, floppy hats and any other clothing that a scarecrow might wear. Make piles containing one of each item. The number of piles is determined either by the number of kids or teams participating. First team with their last team member dressed as a scarecrow wins. Here are some ideas for DIY scarecrow costumes. Number and line up 5 small baskets or crates; have children stand 3 feet (or farther depending on ages) in front of the first crate and toss seeds into the crates in sequence. Small prizes can be given for each of the crates they get their seeds in. This is like a regular cake walk except instead of numbers, place pictures of several Halloween items on the floor. Children walk on the pictures and the names of the items are called out instead numbers. Use themed music such as Monster Mash and Purple People Eater. Base prizes on Halloween theme…or cookies/cupcakes. After playing ALL CHILDREN receive something! Idea***Have a PUMPKIN SEED SPITTING CONTEST OUTSIDE! Who’s can go the farthest?! 45) HALLOWEEN EATING GAMES — PIE EATING! Have one student be the pie eater, who will be standing on the centerline. The pie eater can only move from side to side on the centerline. Build a cardboard ramp about one to two feet side from the ground to the bottom of the pumpkin’s mouth. Tape the ramp to the floor for stability. Mark a starting point a few feet from the start of the ramp: The older the kids, the farther away. Each player gets to hit a golf ball three times. Designate a starting line and a finish line. Set out a bowl full of candy corn for each player at the starting line and an empty bowl at the finish line. The players must use a large spoon to scoop candy corn out of the full bowl and then carry it to the empty bowl and fill it. They cannot spill any candy corn or use their hands! If any candy corn falls off the spoon, they must immediately pick it up and bring it back to the starting line bowl and start over with that scoopful. Set the kids loose and let them find the candy. Be sure to have plenty extra in case a child doesn’t find as much as others. Object of Game: Get three O’s or X’s. Use a “Toss Across” game. Tape pieces of candy or small prizes on some of the O’s and X’s. You can use a paper note stating the prize if the prizes are too big to put on the game. Win a prize by getting three O’s or X’s. Have the kids line up on a line, and count them off by twos. When finished, have the “ones” go on one side of the gym and the “twos” go to the other side of the gym. Have the two groups lined up across from each other. One group are the Goblins, and the other group are the Ghouls. The facilitator will shout out a group, either the Ghouls or Goblins; that group must then chase the opposite group and try to tag as many kids as they can. If a child gets tagged, that player joins the OTHER group. Example: If the leader calls out ‘ghouls’ and four goblins were tagged, those four tagged goblins are now ghouls. This game goes on until there is only one person in the group, and that person is declared the winner. Arrange groups of 4 to 8 children in a circle and give each one a golf ball-sized ball of yarn. Help each child tie an end of the yarn around their waist. Taking turns, each player tosses his yarn to someone else in the circle. When they reach the end of the yarn, they’ve created a web! Now the only challenge is to untangle themselves. Take a ball of yarn and have one person start by holding the yarn. They throw it to another person and it continues until the yarn is all gone. Four or more children sit, stand, or kneel in a circle facing in. One child goes around the circle touching each person on the head as they pass and say “Witch”. They continue around the circle tapping and saying “Witch” until they decide they are ready to tap someone on the head and say “Ghost”. They then proceed to run around the circle. The “Ghost” must run around the circle in the opposite direction. Both are racing for the open spot in the circle. The loser gets to be the caller for the next round. Variations on this game are many including hopping, skipping etc. APPLE-APPLE-PUMPKIN : Play Apple, Apple, Pumpkin! Same game as above. 53) SKELETON, SKELETON, WHERE’S YOUR BONE? Play Hot Potato with a pumpkin instead of a potato. Instead of ‘Simon Says’…play the ‘Pumpkin Says’ … or Witch, Ghost, Goblin, etc. GAMES FROM THE ‘WORM THEME’…that work for Halloween fun! Be sure to have your camera ready–this one is a good photo op! Everyone in each line puts their left hand between their legs and the person behind grabs that hand with their right hand. Then they run at a given signal to the other end of the playing area and back. The first team to return ‘intact’ wins! Have children stand in a straight line with their feet apart. They crawl through the “apples” (children’s spread feet/legs). When the player reaches the front of the apple line, the next person in line becomes the “worm”. Walk your hands forward – without moving your feet up – until you can’t go any farther. If some of the children cannot do this, they could always lie down on the floor and wiggle forward any way they can. 65) PLAY ‘WORMS’ WITH A PARACHUTE! Pumpkin Fists: Make tight fists. Spiders: Tapping fingers on the table/floor. Smashing Spiders: Smash “spiders” with flat hands onto table or floor. Witches hats: Use pincer fingers to make a triangle, place it on your head and make witch noises. Two Ghost Flying: Have children take their hands and press the palms together and “fly” with their arms. Frankenstein Sitting: Sit on a chair or floor and do sit ups with flat palms. Shake the Scaries out: Shake your whole arms and hands. This is one of the best Halloween activities for preschoolers! Sit around in a circle in a darkened room, with a flashlight in the middle of the circle. One player starts the story by saying- “Once there was______”. two or three sentences and stops in the middle of a sentence. The next person picks up where the last left off. Each person builds upon what was previously said. Try to make the stories scary or gross. Once there was a shadow…. Once there was an erie sound that was like.. Challenge friends to a race of the minds. Prepare two banners (or as many as you need for each team) that say whatever you want them to say. Example: Whoo Hoo! Happy Halloween! ; Welcome to the Pumpkin Patch, etc. Also prepare a set of letters for the same words cut out in two different colors– (Orange and Black) for two teams– hidden randomly around the area. Divide the group into teams with captains.The captains sit and wait for their teammates to bring the letters for their banner. If a student is on the “orange” team and sees a letter for the “black” team he/she just leaves it alone. The first team to cover their banner letters wins. Set a kitchen timer for one minute. When the time starts, write down as many Halloween themed related words that you can think of. Example: Halloween, Spooky, Ghosts, Party, Candy, Goodies, Trick or Treat, Monsters, Costumes, Make-up, Blood, Creepy-Crawlies, Spirits, Cauldron, Witch, Pumpkin, Jack-O-Lantern, Broom Stick, Apples, Scarecrow, Haunted, Haunted House, Bats, Cobwebs, Spiders, Spider Web, Scary, etc. Take a Halloween related word. Example: Word choices could be Scarecrow, Broom stick, Costumes, etc. Find as many little words as possible within that word – before the timer runs out. This can be played as individuals, pairs, or teams. Example for Scarecrow: crow, row, scare, care, car,rare, era, race, ace, are, sea, ear, we, case, rear, etc. Jack-O-Lantern example… jack, lantern, cola, jerk, crack, crackle, rack, car, neck, joke, learn, no, ran, rent, etc. Examples for a Halloween Theme: Halloween, Spooky, Ghosts, Party, Candy, Goodies, Trick or Treat, Monsters, Costumes, Make-up, Blood, Creepy, Creepy-Crawlies, Spirits, Cauldron, Witch, Pumpkin, Jack-O-Lantern, Broom Stick, Apples, Scarecrow, Haunt, Haunted House, Bats, Cobwebs, Spiders, Spider Web, Eerie, Monsters, etc. Divide the kids into teams. The first player draws a slip of paper from the bowl; reads it silently and hands to the facilitator. The player then draw clues as to what is on their paper and the team guesses what it is. If the playing team guesses correctly, before the timer runs out, they get two points. If the playing team cannot guess correctly, before the timer runs out, the opposing team may take one guess. If the opposing team guesses correctly they get a point and the playing team loses a point. Most points wins. For younger children — DON’T divide into teams; use a timer or keep track of points. Just play until someone calls out the right answer. ***Idea-Make Everyday Literacy games a Themed game! How about playing TRADITIONAL HANG MAN or BINGO to go with your theme! Themed Bingo cards can be downloaded easily from internet sites such as DLK…also crossword puzzels, word search, etc. can all be theme based. Unscramble the words in the first row…Who can do it the fastest? Looking for Themed Books? The Autumn Book List Category has good lists that include books of Pumpkins Only, Jack-O-Lanterns, Scary, and Halloween!